The Australian reporter Debbie Guest has been doing a great job reporting on the case of Hellfried Sartori and now the deaths of 25 cancer patients – linked to his treatments. Sartori is playing a key role in an ongoing inquest in Western Australia. The controversial case is providing a birds-eye view into the cancer cure conundrum that is facing many chronically ill cancer patients around the world. I believe this is the tip of the iceberg in fraudulent cancer-cure discovery. As stated in “healthyliving.middaily” – I too believe a public enquiry needs to be held into the 11 Dec 2008 MJA errors authored by Ruth Gawler and George Jelinek – not my preference but if my diligent attempts to discuss, mediate and secure a public statement have failed, then it must be achieved through other channels. As I have said before, patients usually don’t read medical journals and they are the ones who need to be informed. The waters of communication and transparency have become very muddied indeed. I emailed detailed proof to the authors of the MJA 2008 article hoping they would make a public statement – but, no reply. Ruth Gawler and George Jelinek work for the Gawler Foundation – however the Gawler Foundation believes that the MJA article has nothing to do with them? This is even more amazing because the Foundation uploaded the MJA 2008 link to their website on 10 December and it has been there since. http://gawlerfoundationmedia.com.au/2008/12/ Note – The day before their article in MJA was officially published. Well, if letting cancer patients and doctors know that incorrect material has been published in a reputable medical journal when it comes to this issue of a high profile cancer remission such as Ian Gawler’s, I would think it to be very helpful indeed! Despite the challenges I remain undaunted in my duty to get this medical maze sorted out. I am hopeful that A Current Affair who filmed an interview with me in early October will eventually go to air…it is currently deferred until they can interview Ian and Ruth Gawler and or George jelinek. This week video footage relevant to the clinical timelines ( taken in the Philippines between March 1976 – May 1979) has been subject to complaint and removed from you tube – seemingly with no recourse from me as the owner and with permission from all to be filmed including Ian. As well my email has been corrupted and still in process of restoration. And now the Gawler Foundation is threatening defamation via a legal letter requesting that I immediately cease publishing material defamatory of the Foundation. I ask – Is the truth defamatory? The Yarra Valley Living Centre was my vision for cancer patients & I devoted years of my life to establishing it. As Gawler Foundation co founder, ex director, therapist and the person who was there 24/7 for years for Ian Gawler as dedicated caregiver, I could never have imagined that my own Foundation would threaten to sue me for being involved with misreporting a part of my own story that, of necessity ran parallel with Ian’s. Now that takes some inner processing! “Cancer patients are amongst our most vulnerable community members. Fear driven by horror stories of chemo suffering and words for alt/med like ‘ cut, burn and poison they put faith in alternative cancer cure stories. Ian Gawler – Is Bemusement the Appropriate Response for Cancer Patients and Caregivers? For more than 3 decades, Australia’s most famous recovered cancer patient has travelled under the medical radar without his medical history being questioned – that is until now. Health, wellbeing and aspiring to assist people with life challenging illness has been a life-long passion. My interest in healing was I believe genetic – a product of my mother’s Irish side of the family. Going back some 52 years to my first day at primary school, I was the only child with wholemeal salad sandwiches, I was vegetarian and had to manage a lot of teasing. My Irish genes served me well and I developed a doggedness for standing up for myself, for what I knew was right and what I knew was right for me. I was also heavily influenced by my health and lifestyle conscious uncle Leo White – alias Kid Young, an Australian champion boxer who was terrific bloke as well as a mentor. I knew that I had a vocation early in life. This manifested initially through healing and veterinary work – I worked as a part time nurse when I was at high school and met Ian Gawler when he came as a locum vet. He offered me a job at his clinic and eventually a relationship blossomed – but within a few months he was diagnosed with bone cancer and had a leg amputated. The rest is history or should I say now, ‘his-story’. Recently I met with Gold Coast Mayor Ron Clarke whose daughter Monique tragically died last year from advanced secondary breast cancer. A believer in natural therapies approaches to cancer, she avidly read self-help books and used natural therapies to alleviate her cancer symptoms for some time. She did not believe in mammograms. By the time she reached hospital – it was too late. Devastating for loving parents to endure. The Satori case from Perth reported in the Australian newspaper last Saturday is another chilling report and a tip of the iceberg in alternative cures for cancer that are flooding the community! Ian Gawler – A Survivor’s Bemusement? The fact that Ian Gawler survived his wrangle with osteogenic sarcoma (bone cancer) is highly significant, however when a cancer suvivor becomes famous for just that – surviving, there are public responsibilities inherent in the role. One of them is accuracy about the story, time-lines and incidents crucial to their survival. A high profile patient must be transparent with the details, medical history, photographic and radiographic evidence and needs to be answerable to the public and the medical community – especially if obvious flaws are brought to their attention. These “flaws” were made very obvious in an article about the patient under the banner of “True Stories” – a 2008 Australian Medical Journal (MJA) article. Medical journal articles give enormous credibility to ‘alternate cancer cure claims’ and are supposedly peer reviewed and accurate. This blog was never intended for speaking out against the story that I was so intimately a part of – however when one can see that the MJA story in question had such a makeover as to make it almost unrecognizable – then for me not to make a statement and rectify the errors in a public forum would be reprehensible. So cancer patients beware: Since most of you don’t have the luxury of reading refutes in medical journals spreading the true version this story is the value of my blog. When open comment is sought after errors are brought to attention and there is silence – I am concerned. When I write to Dr Ruth Gawler, Professor George Jelinek and Ian Gawler about the significant errors and I get no reponse – only silence – I am concerned. When I read their rufute of my factual timeline letter in the MJA and they do not address or worse, show indifference to the facts – I am deeply concerned. When I see comments like the following quote from Ian Gawler saying: – ” It is rather bemusing to be a long term cancer survivor and to have so many people claiming to be responsible for curing you and to have their own version of what you did” – having been instrumental in many of the treatments we tried and having walked the arduous path to his recovery alonside him – I am am not only concerned but shocked! So…. to you the patient or caregiver – if this blog is serving its purpose to help you, it is imperative I address these critical errors in Ian Gawler’s story. Therefore it would be unethical of me and certainly not in the public interest if I chose to ignore the version of Ian Gawler’s medical history and remission story that was published in Dec 11 2008 MJA ( Medical Journal of Australia). Incidentally about the same time Ian’s Biography, The Dragon’s Blessing was penned by Guy Allenby. After almost a year of scrutiny, fact checking and cross referencing – the MJA decided to publish my refute of the story along with original photographs, correct dates and many other corrections. Ironically, Allenby’s biography actually validates the dates I have included in my refute letter!! How could Dr Ruth Gawler and Prof George Jelinek got it so wrong? All they had to do was read the Dragon’s Blessing or previous articles in the Gawler Foundation’s Inspiring People or read the timelines that were previously published on the Gawler Foundation website or even read a copy of the Australian Doctor September 3 1983 as I did when verifying what corresponded with my memory. If I find out the answer to the question – rest assurred it will be published here. 1. The Patient never adhered to a vegan diet – neither throughout his recovery period 1975 – 1978 nor for the following years we were married 1978 – 1997. 2. Inversion of timelines as evidenced by the photographs published by the MJA 2010. 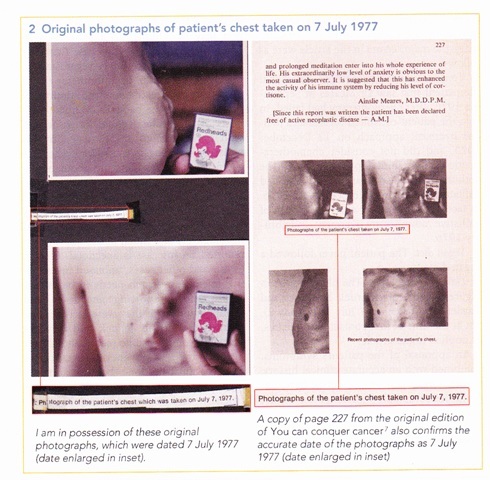 Even in their reply to my refute – Drs Gawler & Jelinek are still claiming these photographs were taken in 1976! !- They were unaware that I had provided the MJA with my originals at the last minute prior to publication. The new date on the photos happens to fit in with their version of the 2008 True story; which states …. only after Ian Gawler failed chemotherapy and other medical treatments – did he then consult Ainslie Meares. However Ian can’t have consulted Ainslie then because he first consulted Meares 12 December 1975. ( see page 74 The Dragon’s Blessing) This is a timeline error of 19 months and corresponds with my memory! Ian’s now very famous photographs are dated and have been reproduced many times in many publications including many of his own. The date is clearly stated – they were taken 7 July 1977 when Ian Gawler was basically well – not when he was critically ill Feb 1976. 3. The 3rd not so publicly known issue: That Ian failed to correct Ainslie Meares wrong version of our story in 1978. Meares also inverted critical medical timelines. He also states Ian had a mid thigh amputation. Ian is aware I have tried to correct this error since 1978. I encourage you to look at the facts – view the MJA articles online and then make up your own mind. The question of why the story changed after 1996 and why the makeover aoccurred just might be related to attempts to write me out of Ian’s story and the Gawler Foundation’s history. Failing to report the whole story in context and accurately presented is a great travesty for cancer patients and caregivers. If you would like more information and an information package on this topic please email me via my website. Ian Gawler – A Survivor's Bemusement? Author grace_gawlerPosted on November 1, 2010 Categories Cancer survival information, Integrated medicine, Medical Journal Articles, Publications, Recent media and videosTags a survivors bemusement, adam cesswell, ainslie meares, cancer education, cancer help, cancer patient outcomes, cancer recovery, cancer solutions, cancer support, cancer survival, Dr Ruth Gawler, Gawler Foundation, Grace Gawler, ian gawler, integrated cancer solutions, Integrated medicine, integrated oncology, Medical Journal of Australia, meditation, MJA, out on a limb, Professor George Jelinek, psychosocial support, RACGP, ruth gawler, surviving cancer, The Australian2 Comments on Ian Gawler – A Survivor's Bemusement?